Two weeks from today some 30,000 runners will take on the Boston Marathon! And four of them are part of the 2019 Running for Research team raising funds for the Massage Therapy Foundation (MTF). Good luck: John Cassinerio, Washington; Rocky Chen, Oklahoma; Kim Nimmo, Wyoming; and Joyce Prahasky, Florida. In addition, this year there is a new component that showcases massage therapy and continuing education, and benefits the MTF. Drew Freedman of The Boston Bodyworker is spearheading the Feel Better Boston event, offering 30-minute bodywork sessions for runners and kinesiology taping continuing education courses for massage therapists at the Seaport Hotel April 13–15. ABMP is proud to be a sponsor, and all proceeds benefit the MTF and The Martin Richard Foundation. The first 30 therapists who volunteer (click here for the volunteer form) are eligible to win new massage tables and products from industry partners Massage Warehouse and Performance Health. I’m not a runner, but I’ve been fortunate to support all seven charity teams from the MTF, tracing back to 2013, as they worked their way to the finish line on Boylston Street. The marathon is always run on a Monday, and that day is a Massachusetts holiday called Patriots’ Day. Some 1 million spectators line the route; it’s impossible to explain how thrilling it is to cheer on runners of all sizes, nationalities, abilities, and backgrounds. And Boston embraces them all. On Monday morning, April 15, the training schedules have hopefully been fulfilled and Vaseline has been applied everywhere it’s assumed to be needed. Even after the runners cross the finish line, they’ll still be working hard to meet their aggressive fundraising goals. I can only begin to admire their level of conditioning and commitment—both on and off the trail. The now-infamous marathon of 2013 was the first year the foundation was awarded charity bibs—three of them. It was fitting that the marathon’s corporate sponsor, John Hancock, acknowledged this natural partnership between therapeutic massage and the sport of running. Years of hard work by massage therapists and industry leaders such as Mary White and Cliff Korn led to this success; for years they massaged elite runners from around the world and reflected the heart of the profession and the foundation, lobbying for the MTF to be awarded charity bibs. 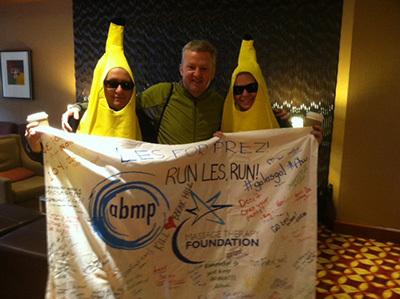 That first year, ABMP’s President Les Sweeney ran. Les is a lifelong runner, no stranger to testing his limits, but the bombings stopped the race and kept him from the finish line, so he ran again in 2014. ABMP Education Liaison Kathy Laskye and ABMP Advertising Director Angie Parris-Raney ran on behalf of the foundation in 2014 and 2015, respectively. In all, the trio raised more than $44,000 for the MTF. Many of us are proud to donate to this worthy cause year after year. The past three years, the MTF has been awarded four bibs because of its outstanding fundraising efforts. Since its inception, the program has raised more than $325,000—all for the MTF to fulfill its mission to fund research, education, and community service projects. 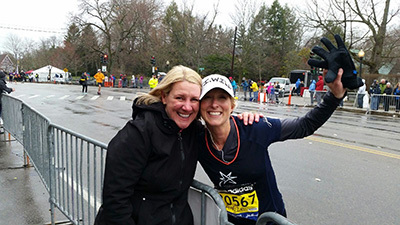 To volunteer for Feel Better Boston, visit https://bostonbodyworker.com/marathon/volunteer-form. For more information about participating in Feel Better Boston, visit https://bostonbodyworker.com/marathon or email events@bostonbodyworker.com.